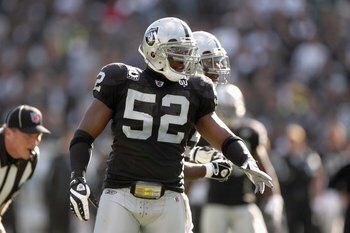 News broke on Wednesday evening that the Bills had come to terms with inside linebacker Kirk Morrison. It is reportedly a one-year deal for the man who was replaced by Paul Pozluszny in Jacksonville. Morrison is no slouch, he has amassed over 100 tackles in five of his six pro seasons. The only year he failed to eclipse 100 was last season with the Jaguars. While Morrison’s main experience has come in a 4-3 look, I don’t expect him to struggle much with the Bills. Most of the reports out cite Reggie Torbor’s uncertain injury status as the reason for signing Morrison. I would like the cite the fact that Torbor has looked incredibly slow in the preseason and seemed unable to cover in space, an issue Bills’ linebackers had last year as well. Morrison should help in that regard while adding some serious experience to the depth chart at inside linebacker. After Andra Davis and Nick Barnett, the Bills are terribly thin. The already injured Torbor is followed by Arthur Moats, Kelvin Sheppard and Chris White. There are others undrafted free agents floating around there, but few have inspired much hope to stick around this season. Not to mention, Reggie Torbor would be among my first cuts based on the production he has been able to offer thus far. In terms of a strict trade-off between Torbor and Morrison, this is a major win for the Bills. Another interesting facet of this signing is what it does for Moats and White. Based on a strict numbers game one of the two would be out on the street, and that very well may be the case. Moats has not adapted well to the inside – a real shocker considering he wasn’t very good last year at the same position. White has been hurt much of camp (just like Sheppard) and might fall to the chopping block due to that. My personal take on the matter would be to bump Moats back to the outside, where he belongs, and keep White on you depth chart at ILB. Torbor would be the player I cut in this scenario. He doesn’t bring much to the table and Morrison surpasses anything the Bills got out of Torbor. That does hinge on the severity of Torbor’s injury because even by cutting him you are looking at 26 players on the defensive side of the ball, including 10 linebackers. That could be a tough position to be in for the Bills depending on their plans offensively. Of course, with the way they are running the offense it doesn’t seem like they care much anyway. However, White or Moats will likely remain on the bubble for the foreseeable future based on the numbers game that one of them will likely fall victim to. For my money, the only one you part ways with is Torbor, if you must I could cut Chris White as well. Only because he has missed quite a bit of time and he was a late-round selection as it was, there is little chance he would be a serious contributor. Of course, I would also move Moats back to the outside because they are completely wasting him as an inside linebacker. At least one piece of that scenario is bound to play out. The Bills are employing far too many linebackers to not pare down some familiar names one way or the other. It would certainly appear to be business as usual if they decided to part ways with one of their most productive defenders from 2010 because of an ill-advised move to a new position and an unfortunate numbers game. Either way, bringing Morrison into the fold was a wise decision, if only they could do the same with a free agent tackle.